The Carten HiLife Series has been developed to react to new challenges in industries that require solutions to abrasive and corrosive media, in particular fine powder pneumatic convey applications (PCI, TiO2, and Polysilicon). 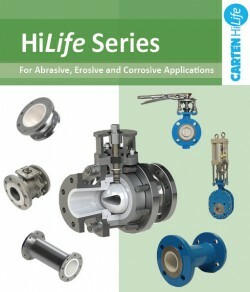 Carten manufactures and supplies the HiLife Series from our facility in Waterford, Ireland. Taking into consideration the frequent maintenance and replacement costs required of competitor severe-service valves, the HiLife clearly improves on overall service life, accuracy and control and reduces the total cost of ownership in erosive and abrasive systems.